The Centre for Handicapped is located in Kundasale, Kandy, Sri Lanka. It acquired this name in 2001 having previously been the Kandy Orthopaedic Centre for People with Disabilities. 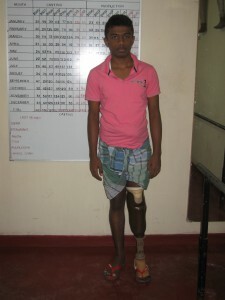 The Centre has so far provided nearly 11,000 limbs to amputees who have now re-joined mobile society. Limbs are provided free of charge to those who are unable to pay for them. Individuals who have been helped include small children, school children, teachers, office workers, tradesmen, cultivators, farmers, housewives and many others. All have had the misfortune of either being born with a congenital problem or they have lost one or both legs due to one of many causes including road and rail accidents, warfare, land mines, human fighting, snake bites and diseases. People in need come from all parts of the island of Sri Lanka. They arrive in despair and the Centre aims to have them leaving with fresh hope that they will return to their schools, families and places of employment with mobility restored. The Centre is fully equipped with its own prosthetic and orthotic unit which provides custom made artificial limbs to suit each individual in need. A physiotherapy unit provides training and rehabilitation for all amputees fitted with new limbs. The Centre also provides a transit hostel where amputees may stay whilst they are being fitted and trained. The facility is also provided free of charge. Products of the Centre for Handicapped include mobilty aids, below knee prosthesis, above knee prosthesis, ankle foot orthosis, hip knee ankle foot orthosis, spinal orthosis, and wrist/hand orthosis. It has also recently started a programme of making micro-loans to recipients of limbs as an incentive for them to gain employment and generate income in a sustainable manner. The Centre for Handicapped is a voluntary organisation, depending on benefactors who make the work possible through donations or sponsorship of a limb or some other activity of the Centre. Any person in need will be accommodated, funds permitting, irrespective of their caste, creed, ethnicity and social status. At present there are around 400 individuals on a waiting list for funding for limbs and wheelchairs. Project Sri Lanka is very pleased to be associated with this highly worthwhile Centre and is supporting various aspects of its endeavours. In July 2015 the Chairman carried to Sri Lanka two items of mobility equipment donated by Moira Mclean of Berwick-upon-Tweed. These were greatly appreciated by the Centre and were put to immediate good use as the attached explains. 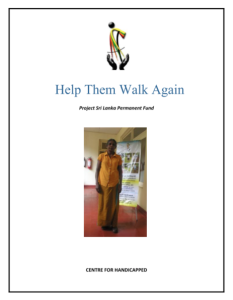 Two gentlemen, Mr Gunasinghe and Mr Prasana are now able to walk with the assistance of these items. In October 2015 we were delighted to hear that our ‘Permanent Fund’ which provides a limb every year in perpetuity has this year enabled Mrs Rathnawathi to walk again. This lady was seriously injured in a road accident which led to amputation of one of her legs from the knee down. Further details can be read in the Report linked to this page.